Early in this massive biography, Ambrose makes the ironic statement that, at 25, Nixon was considered to be so honest, scrupulous, and upright that had he opened a used-car lot, his peers would have flocked to buy cars from him. The statement captures the tone of this, the definitive biography of an enigma. Ambrose, whose career as a historian has seemed to gel in recent years as the primary biographer of Eisenhower, captures Nixon as a prisoner of ironies in this first of two volumes that takes us up to the "last press conference" after Nixon's 1962 California gubernatorial defeat. Nixon's rise was meteoric. (Consider the equivalent: a freshman representative entering Congress this year would be elected Vice-President in 1992!) But, as Ambrose shows, this was only typical. Within months of joining any organization, from grade school on, Nixon would so shine that he would be granted the presidency. It was only natural that he should consider the Vice-Presidency and Presidency as plausible career steps. But it wasn't just a matter of brutal ambition. Friends and enemies alike conceded that the man possessed a brilliant political mind. And this, in turn, was fed by a remarkable memory and sheer hard work (Nixon could go days without sleep in preparing for important trips or events). It was unfortunate for him that he had to ride the coattails of Eisenhower, whose feelings for Nixon were fatherly in the best and worst sense of the word. While grooming Nixon to take on the burdens of the Presidency, he never quite considered him mature enough. Nixon's tireless and great service to the Republican Party often irked Eisenhower, who cared not a whit for party affiliation. Ambrose brings out other ironies'. The supposed campaign of vilification against Helen Gahagan Douglas in 1950, for instance, was actually begun by Douglas, who first tried to besmirch Nixon's voting record! And the conception of Nixon as an extreme right-winger depended too heavily on Nixon's partisan lambasting of Democrats who were "soft on Communism." Ambrose convincingly demonstrates that in domestic policies, Nixon was actually one of the more progressive Republicans of the 1950's, but he had to quell that spirit because of Eisenhower. Nixon's progressivism was particularly apparent in his promotion of black rights. In this regard, Martin Luther King, Jr., actually voted for the Eisenhower ticket in 1956 because of Nixon. 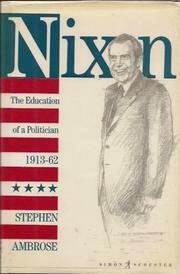 Most previous biographies of Nixon have either been admiring political studies or hatchet jobs by obvious enemies. Ambrose rights both of their wrongs and gives us a wonderful preliminary to the final volume, which will chronicle Nixon's resurrection, triumph, and fall. Masterful biography.